Mexico’s Abraham Ancer has taken the third round lead at the Australian Open at The Lakes in Sydney today. On a day when scoring was difficult with strong southerly winds lashing the course, Ancer nailed his third round firing a 7-under-par 65 for a five shot lead heading into the final round. “It was a tough round. I knew since hole 1 it was going to be blowing the whole day, I had to stay patient and just keep the ball in play, and I was able to do that,” said Ancer. 18-year-old Japanese amateur, Keita Nakajima, is in second place at 8-under-par followed by a string of players in a tie for third at 7-under-par including Keegan Bradley, Marcus Fraser and Matt Kuchar. 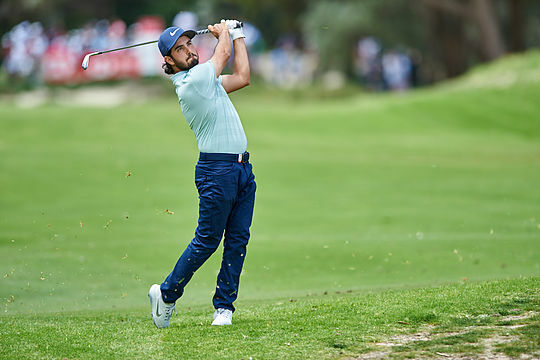 Fraser, a three-time European Tour winner is the best of the Aussies with the Victorian firing a 1-under-par round 71, after opening with a pair of 69′s. The top-10 sees Dimi Papadatos, Cameron Percy, Aaron Pike, Maverick Antcliff, amateur David Micheluzzi and Max McCardle. With a sizeable lead heading into the final round Ancer will take some stopping. With two top-5 finishes on the PGA Tour since October, the 27-year-old will be looking for his first breakthrough tour victory since his Web.Com Tour win in 2015. Given accuracy from the tee at The Lakes is imperative, Ancer, who is ranked 19th in driving accuracy on the PGA Tour is in the prime seat to be holding the Stonehaven Cup tomorrow evening.